The Lubri-Sil I.C. 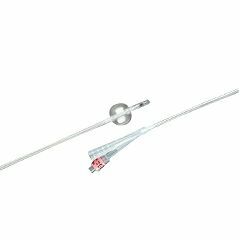 antimicrobial 100% silicone Foley catheter incorporates a technologically-advanced formulation consisting of Bacti-Guard silver alloy coating and Bard hydrogel. The coating on the Lubri-Sil I.C. Foley catheter is designed to minimize biofilm formation and enhance patient comfort. In vitro testing of bacterial adherence demonstrates that the Lubri-Sil I.C. Foley catheter with Bacti-Guard silver alloy coating and Bard hydrogel reduces adhesion of the bacteria most commonly associated with catheter-associated urinary tract infections (CAUTIs). easy insertion . less buildup. glide into place. comfortable. less changes. I have been cathedered for 22 months. I am a very difficult placement and suffer high sediment which stops the catheter from working. Early on I realized that silicone was best (wider tubing than latex). I then researched the best catheters available and found this one on a paraplegic website. I bought one and the thing glided into place with no repeated attempts or pain. I was sold. So much so that I bring my own with me to the hospital where I go frequently. Anyone who is looking for a comfortable, easy glide, pain free and longer lasting catheter cannot go wrong with these. I just wish they were less expensive. They are worth every cent. very easy to use. inserts easily. This Catheter works wonders. My dad has to have a Catheter for the rest of his life and his is changed every two weeks and the regular Caths the Home Health Nurses were having a hard time with even making him bleed at times and with this Cath it slides right into place and doesn't cause sediment to appear and helps with UTI's. once a week. prone to UTI. body rejection. Husband was having constant infections. Every three weeks he would be altered and had an UTI. We got a new urologist and infectious disease doctor who recommended this silver lined catheter. We are now having the catheter changed every week, and so far he is doing better than he has in years. When home care brought a different catheter because they didn't order this one, he was sick the very next day. Luckily I found them here, and got them in a week. Home care still hasn't received them. I will not allow any other catheter to be used on him because it is the only catheter his body can tolerate. I will always have these on hand even though home care should be providing them because they have made such a big difference. I have had fewer infections since using this catheter along with taking a daily antibiotic. Is this usable for a supra pubic catheter? Does it come in a 24" French?